First, let us put things in their 1810 context. After his victory at Wagram in 1809, Napoléon is in a position to force Austria to sign a humiliating peace treaty. The French Empire has never been so powerful: it extends all over continental Europe, but the Emperor still has no heir and Joséphine’s day as his consort are clearly numbered. 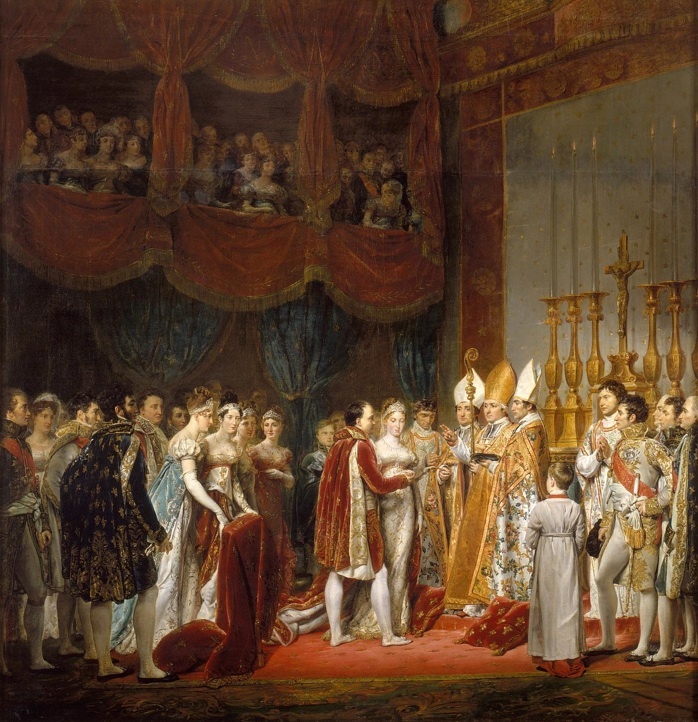 After the peace, things go very fast: on the 16th of december 1809, the French Senate proclaims the dissolution of the marriage of Napoléon and Joséphine. Napoléon first thinks of the Tsar’s sister for his new Empress. But the Russian monarch is reluctant to enter into such an alliance, and Napoléon turns his sights to one of the daughters of the Emperor of Austria, Archduchess Maria Luisa. The young woman (she is but 18) has been brought up to hate and loathe Napoléon, but, in spite of her fears and misgivings over her great-aunt Marie-Antoinette’s fate, she is pliable. I already wrote about Marie-Louise’s arrival in France and the dire welcome extended to her by Caroline Bonaparte, one of Napoléon’s sisters. As for the wedding itself, it takes place, not at Notre-Dame or any of Paris’s many great churches, but at the Louvre, in the Salon Carré. If you know only one room in the Louvre, this is the one, for it houses to this day Leonardo Da Vinci’s Mona Lisa and the Madonna of the Rocks, among other masterpieces. But on the day of her wedding, the new Empress, in her bridal finery beheld no such wonders. In order to install galleries for the spectators, all of the paintings had been moved out of the room for the ceremony, over the strenuous opposition of Monsieur Denon, the museum’s first director. The walls were covered with crimson draperies and Gobelins tapestries for the occasion, and an altar had been set up. The painting above, by Rouget, depicts the blessing of the rings and gold coins exchanged by the spouses. After the celebration of a wedding Mass, Napoléon insisted that the etiquette of the Grand Couvert, the public dinner the late Marie-Antoinette hated so much, be revived for the wedding banquet. It is represented here by Alexandre Dufay, alias Casanova. The banquet is held in the newly appointed State Room of the Palace of the Tuileries, part of the Louvre compound. Napoléon’s mother and siblings are seated in a semi-circle around the newlyweds. Courtiers stand in the galleries. The banquet lasts but twenty minutes (remember that Napoléon has no interest in food.) According to Captain Coignet, eyewitness to an imperial Grand Couvert, “nobody uttered a word. One was only allowed to speak when addressed by the sovereign master. Imposing it may be, but cheerful it ain’t.” The painting somehow manages to convey the stifling atmosphere of the wedding festivities. In any case, I wish Miss Catherine Middleton and Prince William a much cheerier wedding, and much happiness in matrimony.